My first French Breakfast Radish harvest this past week was very inspiring. Seeing their little red shoulders finally pushing out of the ground after checking on them each week and finding several good size ones for harvest made my day. Taking my favorite red bowl out of the cupboard and turning my radishes into a crunchy salad with bacon and walnuts lightly bathed in a creamy vinaigrette was a done deal. The radish greens were tender and I knew they had to be included in my salad. Earlier in the season I even enjoyed the radish sprouts that I thinned from this crop on a beet salad with goat cheese. I cashed in on this crop of radishes big time and there is even one more thing I would like to create- my first blogger’s award. As you can see from my blog’s sidebar I follow many food blogs and have several favorites that often inspire me. So, I decided to create an award recognizing inspiration that I would like to pass on to the people who inspire me. This award will be given away on my blog when the inspiration I feel from reading a post is off the charts for me, kind of like one of those applause meters when it shoots over to the noisy side during a competition like ‘Queen For A day’, boy am I dating myself, can’t believe I came up with that one for an example! Place the radishes, walnuts, bacon and radish greens into a medium size bowl. In a small bowl whisk together the crème fraiche, walnut oil, sherry vinegar, honey, sea salt and pepper. Spoon the dressing over the radish mixture and gently stir to coat. Isn’t this a gorgeous harvest of radishes? 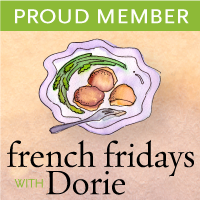 My first Award For Inspiration goes to Desserts By Candy for her Nutella Tartine post for French Fridays with Dorie, Allure of Homemade. Congratulations to Candy and please go check out her post! The best tasting radish there is…and you have a dandy bunch there. Patty – I am SOOOO loving this salad. I am impressed that you grew those lovely radishes – they are just perfect. BTW – I am very impressed with your styling prowess – nice job!!! Lucky you, I can't wait to get moved so I can plant some things. Well Candy is one lucky lady. Don't worry Patty, I'm saving the camera for you, lol. We missed you at lunch. I got your message, sorry I haven't gotten back to you yet. How awesome, Patty! We just cleaned out our garden & are trying to decide what to plant next. I was just thinking that we haven't been eating enough salad lately. I'm way early with the Chocolate Tartlettes – you have plenty of time to make them! Truthfully, they are super-rich – and I like your ganache-filled mini tarts better! Hi Patty, happy valentine day to you. Your salad look delicious and lovely presentation. Loves your beautiful harvest. My husband would love this salad so much! (I would, too!) 3 of our favorite foods, and it's gorgeous, too. What a great idea! I love radishes so much. I love their taste, their crunch and their pretty red and white color. No one in my family likes them but me. When I was a little girl I would eat them whole without slicing, like you'd eat a carrot. What fun to have a garden to Harvest this lovely vegetable. Your salad looks delicious and the vinaigrette sounds fantastic. As for your photos, I'd submit those somewhere, they're stunning – especially the row of radishes lined up on the bench. whoa … those radishes are so FRESH and GORGEOUS! mm…these radish greens…I guess some pesto? I am so envious of your beautiful radishes! I try growing them last year and it was a horrible flop. I may try a different location this year but it will be another two months at least! Wow Patty, love your radishes…nothing like making a dish that comes from the backyard. Like how you put together this salad…bacon and walnut…gorgeous color as well. OOhh..adoro los rábanos están hermosos una cosecha estupenda,qué rico es comer ensalada fresca y de casa,bellísima presentación ,abrazos hugs,hugs. Your radishes are gorgeous! I think radishes are so pretty anyways but your picture is just beautiful and the salad sounds amazing! Your salad looks perfect–your radishes are beautiful! It is so rewarding to create dishes out of things you have grown yourself. I can't wait for spring so we can plant our garden! Such a beautiful harvest of radishes you have, Patty! The salad is practically a meal by itself. So crunchy, tasty, and satisfying. Love the creamy dressing you made for it! Your radishes are stunning, Patty! Love the sound of this delicious salad. And your photos are absolutely gorgeous! My goodness your own radishes! It was cloudy and raining when I was in SF last weekend. Darn it. Rain followed me every where. I will have to steal your creamy vinigrette dressing as I'm looking for one to mimick walnut and beet salad I had at Cascal! What a lovely blog award! I'll be sure to check out her post. Your radishes are stunning!! and the vinigrette is the perfect touch for a this lovely salad! What a pretty salad. I forget about radishes – shame on me when they are so healthy and delicious. Thanks for the reminder. Those radishes are just wonderful, I so want to sneak into your yard and grab some Beautiful salad as well, and love that you included the greens The vinaigrette is delightful as well! How delightful, Patty! What beautiful photos, especially the last one of the radishes just picked from your garden. Nothing beats eating food that you have grown yourself. Those radishes look so good. I can hardly wait to have radishes from the garden again. We're just getting ready to start planting again, though I also just took the last of my beets and Swiss chard out of my garden last week, so I guess I can't complain. Desserts By Candy is a great choice for your blog award – her posts are always wonderful. I can see why they were such an inspiration…I'm feeling inspired after reading this post…and I can't wait to check out the award winner's. Thank you for sharing. I'm sorry I was absent last week…I've been traveling back and forth from Houston. I hope you have a fantastic start to your week. I'm about to get baking again! Your created award is a real lovely idea and colorfully inspiring as well. Have a great week Patty. What a beautiful salad! I will have to try this when I get some radishes. Love the addition of walnuts and bacon. Patty, What a harvest! And the salad we'll you always make not only delicious but beautiful salads. Congrats on the harvest and the creation of your award.